Love and War is the title of a song by Tamar Braxton. It’s also the name of a branding and advertising agency based in New York City. There is a TV series from the early 1990s called Love and War. John and Stasi Eldredge wrote a book, using that title (Love and War: Find Your Way to Something Beautiful in Your Marriage). Now there is photographer Guillaume Simoneau‘s Love & War . Love and war, could there be any grander themes? Take away love and war from the history of art, and what would be left? You’re sweeping with a big, big brush when you aim to address the big, big themes. And why wouldn’t you? But there’s the risk to get (sorry!) swept away, and there are all the cliches lurking around the various corners. Love & War contains a large number of portraits of a young woman, Caroline Annandale. The photographer, we are told in the beginning essay, met Annandale at the Maine Photographic Workshops in 2000, and they fell in love. Most of the portraits are from around 2008. 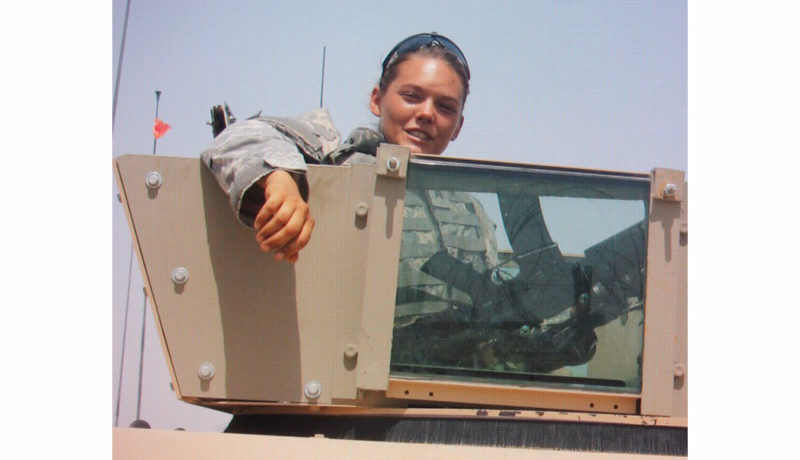 In these eight years, Annandale enlisted in the US military, and she spent time in Iraq. She also married another man (this we learn from a print-out of an email to the photographer, a photograph of which is included in the book). What happened to that man – or the marriage – we don’t know. How and why Simoneau and Annandale reconnected we also aren’t told, not that it matters. There then are love and war, intertwined in obvious and non-obvious ways. And there are the kinds of complications life throws at you when you’re dealing with love (which I have, just like, I assume, everybody else), and when you’re dealing with war (which I have not). But somehow, things might be a tad too simple here. For a start, love involves two people, and somehow the book pretends there’s really only one, the woman, with the other one, the man, hovering in the background, reduced to, we are led to believe, taking pictures. And that in itself would be a great story, because that can be the reality of love, seen from the perspective of that man. As a matter of fact, it is the reality of love here, seen from the perspective of that man, the photographer. You actually don’t have to throw in war for this to be a potentially heart-breaking story (pardon the cliche). Now, of course, Annandale did go to war. Omitting this would seem, well, weird. We see the transformation of a young woman into a slightly older, yet infinitely tougher looking woman. War will do this to people. However, you don’t actually go to war to experience such changes. People undergo rapid changes in a few years due to all kinds of circumstances. What I’m trying to get at here is that the book essentially has two major strands, both of which feel somewhat unresolved. Given how much I enjoy seeing many of the photographs, I feel that that’s too bad. There is such huge potential to deal with all the complicated things that might happen when you fall in love with someone somewhere, and then that person gets married, and you reconnect, and the person has changed so much. There also is such huge potential to deal with just these few years in which a young woman, shown to be mostly carefree, decides to go to war and watches her comrades blown to pieces (there is some text by Annandale at the end of the book that talks about exactly that). Throw these two things together, and there might be a lot of loose ends. But, and this is a big, big but: Photobooks are not made to satisfy the audience’s demands. Photobooks are not like TV shows or internet articles, where it matters that the ratings are good, that things go viral. What I want a photobook to be or tell me essentially is irrelevant, because I am not the maker. Seeing someone react to a different photobook (which I like very much) the other day had me think about this. It’s so tempting for an audience to expect that an artist does something for them. But that’s really not the idea, and the medium internet (which is, let’s face it, focused on the idea that merit scales with the number of “likes”) ends up reinforcing the wrong idea. In other words, if I feel like there might be too many loose ends here, then, well, that might just be my problem. A photobook does not have to be like a Hollywood movie where you can expect your happy ending before you leave the movie theater. Life in general usually doesn’t work that way (otherwise, there’d be a lot less books and movies about love! ), and photobooks don’t, either. Instead, life can be full of loose ends that you end up trying to connect, even though they just won’t connect. Ultimately, this is what Love & War shows, or tries to show. There is only so much you can do with photography, actually with any medium. You’re better off coming to terms with your medium’s limitations, instead of trying to make it do things it just can’t do. And you might end up being better off realizing that life doesn’t always make the kind of sense you’d love it to make, especially not when love, or war, or love and war are involved.